Hal Jordan (Ryan Reynolds) is a test pilot who becomes an intergalactic cop when he finds a dying alien peacekeeper (Temuera Morrison) with a power ring able to conjure up anything its wearer can imagine. The near-sentient ring chooses Jordan as the alien's successor because he is fearless and virtuous, the best example humanity can offer. Jordan is then inducted into the Green Lantern Corps, a fraternity of aliens from across the vast universe who each police their own sector under the guidance of the immortal, blue-skinned ancients known as the Guardians. With little training, Jordan is enlisted in the search for his predecessor's killer, a renegade monster named Parallax (Clancy Brown). This yellow cloud creature is the embodiment of fear, growing more powerful with each star system it destroys, and Earth is, of course, its next target. 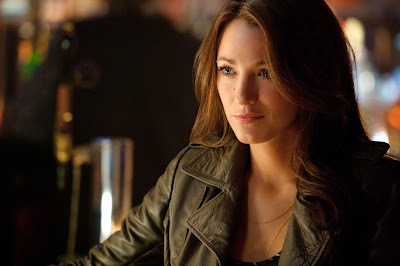 Jordan must juggle his newfound powers, his doubts about joining a legendary police force, and his relationship problems with his boss, Carol Ferris (Blake Lively), as he learns to accept his new career as a Green Lantern. In comics, one of GL's most interesting qualities is his distinct, conservative outlook as a lawman. His initial, unwavering belief that the all-knowing Guardians are always right—despite evidence to the contrary—immediately puts him at odds with a fellow Green Lantern, the magenta-skinned Sinestro (Mark Strong), as well as many of his fellow heroes (most notably the liberal Green Arrow). GL's right-leaning streak is a characteristic that has so far gone unexplored in the increasingly tedious succession of superhero movies making their way to the multiplexes. The miscasting of Reynolds—the happy-go-lucky antithesis of the comic book's stern, awe-struck spaceman—is a mistake that fundamentally mars Green Lantern, the film. The comic book GL is singular for being eager to help the militaristic corps vanquish all evil-doers. In this film, Reynolds portrays him, not unlike Ralph Hinkley in TV's comedicThe Greatest American Hero, as a reluctant participant inconveniently drafted into service by the ring. This angst-ridden take on Green Lantern is representative of Warner Brothers' decision to take a page from Marvel Entertainment's playbook. Now, Jordan is a mope like Spider-Man, fretting about whether he is up to the task of handling such a responsibility. This despite his background as the type of aircraft pilot entrusted with powerful, complicated jet prototypes whose cost lies somewhere in the multi-millions. No matter, the filmmakers reinforce Jordan's immaturity by having the character recklessly scuttle one of the planes he's testing. Like Robert Downey's Iron Man, Reynolds continually tries to prove to his straitlaced girlfriend that he's got the stuff to be a better man. Green Lantern even has its own version of Samuel Jackson's Nick Fury, Amanda Waller (Angela Bassett), DC Comics' chief government operative presiding over that pubishing universe's metahumans. Instead of concentrating on successfully launching Green Lantern, a second-tier character, into an ignorant public's consciousness, Warner Brothers is already starting to build its own mega-movie universe of crossovers much like Marvel's. At least Marvel had one triumph—in the form of the diverting Iron Man—that they could build on. The interesting dynamic between Jordan and his fellow Green Lanterns is left mostly unexplored. Jordan's initial wonder at the sights he encounters in space get a brief cameo thanks to Reynolds' enthusiasm when his character learns he can fly. But beyond that, Jordan doesn't get much interaction with his unusual cohorts, Tomar-Re (Geoffrey Rush) or Kilowog (Michael Clarke Duncan)—save for one brief training sequence. He barely gets more time with Sinestro, his jealous rival for fair-haired boy status in the eyes of the patriarchal Guardians. Like in this summer's Thor, you want Green Lantern to escape its earthly confines and spend more time in its epic-scale, cosmic arena. There's certainly enough in Green Lantern's backstory to forge a Star Wars-level space saga, if one wanted to. But the movie repeatedly abandons that setting in favor of the more pedestrian, predictable romantic plotlines on Earth in an effort to appeal to a female demographic that will (unless they show up for a look at Reynolds' twelve-pack) likely skip out on the film altogether. As for Warner Brothers' hopes for a new superhero mega-franchise, Green Lantern is quickly starting to look like an ambitious failure. This is a pretty spot on review. Yesterday I posted my own clipped thoughts elsewhere but have reiterated them to share here. The biggest problem with Green Lantern ...is that it’s a superhero movie. As you’ve stated, the overly familiar superhero movie tropes are what really dragged it down for me. 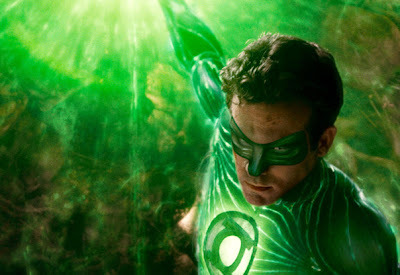 However, when it not being a generic superhero movie, Green Lantern goes gonzo as a full blown sci-fi fantasy space opera, and that’s the part of the movie I really enjoyed and would have preferred to see all the way through. I strongly disagree with those who ridicule the film for its alleged poor quality in look and design. It’s easy to slap this movie for its unrealistic, un-naturalistic, even downright silly CGI, but this is a fundamentally inane criticism when one considers the outlandish subject matter. How else could it possibly look? I personally loved the super bright alien world of Oa (I saw the movie in 2D proper) in the way it aspired to the 1930s, ‘40s and even ‘60s pulp cosmic aesthetic. I don’t want reality grounded naturalism. I want far-out retro wonders, and that’s what this movie gave me. The only problem is that it didn’t give it in spades. When Hal Jordan awakes on a strange planet light years away from home, stands up and sees his slightly warped reflection in full Lantern mode, such was the beginning of a truly fantastic, extended set-piece that makes for top-notch escapism. Moments later he finds himself surrounded by a mass army of bizarre alien creatures--that is where the movie should have stayed. I wanted those bizarre aliens to become main characters whose trust and friendship Hal would earn over the course of a space adventure narrative. But, alas, that particular movie was not to be, for Hal and the audience both are literally zapped back down to boring Earth where the set-pieces feel tired and the story drags from multiple apartment scenes to a lame romance to a tedious sub-plot involving a Hector Hammond, his employers and a resentful father-son relationship; Tim Robbins and Angela Basset seemed totally awkward in this movie, though I will admit that Sarsgaard made the most of his transformation into an evil Mr. Potato head. I also think Mark Strong gave the most dramatic performance as Sinestro and both Jeffery Rush and Michael Clark Duncan did great voice work for some delightfully animated aliens. Even Temuera Morrison’s brief role as the purple skinned Abin Sur had some resonance to it. I also agree that Reynolds, though physically appropriate and likable enough on his own, was simply not the right personification of the title character; the reasons for which you explain very well. Green Lantern was ripe for a refreshingly pro-action, Superman-like hero of conviction instead of the jokey man-child version depicted here, whose character arc feels derivative to mind numbing degrees. There were brief moments where Reynolds ditches the stupid smile and nonchalant manner and grits his jaw squarely during the character’s most tableau stand-offs against overwhelming evil – singular images, really. Too bad the bulk of his portrayal was something else. The mythology is nonsensical and the plot takes forever to get going. But once it does, the movie takes advantage of a strong cast and a director who knows what he’s doing. Good Review! Check out mine when you can! I really enjoyed this movie. The story dragged in some areas but it stayed as true to the comics as it possibly could. Ryan Reynolds has the charm necessary to pull of the character! He looks to have the same personality in most movies he is in, but it works well here. I like his power and the special effects were great.